Innovations: Social Inclusion at Work by Janis Chadsey. This book is intended to illustrate how to socially integrate people with disabilities into employment settings. It is designed for secondary teachers, vocational specialists, job coaches, and other service providers. Pp. 49. 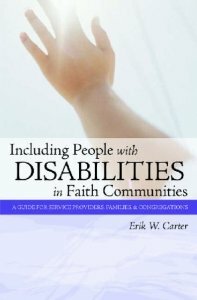 Including People With Disabilities in Faith Communities: A Guide for Service Providers, Families, & Congregations by Erik W. Cater. The only available practical guide on how to include people with disabilities in religious communities. Erik Carter’s interest in this topic has been an abiding part of his research, and he is one of the leaders in discussion inclusion and faith. Pathways to Participation: Planning Community Outings for Children with Autism Spectrum Disorders by Rachel Huckfeldt, M.S. BCBA and Rebecca Trammell, M.S., CCC/SLP. This manual presents a model for teaching full community inclusion for children with autism between the ages of five and eleven. The activities are intended for children with autism who are at least partially included in an age-appropriate general education classroom, have the ability to attend to a teacher, and have some functional self-management skills. 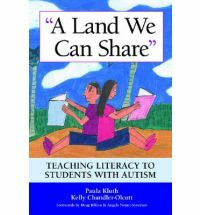 A Land We Can Share: Teaching Literacy to Students with Autism By Paula Kluth. This book demolishes the ‘great wall of exclusion’ that has often kept learners with autism segregated from literacy, reading, and language arts activities, the final frontier of inclusion. Filled with clear real-life examples, tools and practices, Paula Kluth and Kelly Chandler-Olcott have built a new foundation that promotes inclusive literacy assessment, development, and learning. Pp.248. 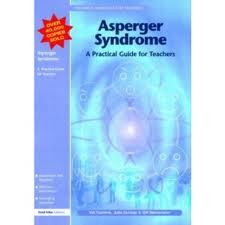 Asperger Syndrome: A Practical Guide for Teachers (Resource Materials for Teachers) by Val Cumine. This is a clear and concise guide to effective classroom practice for teachers and support assistants working with children with Asperger Syndrome in mainstream schools and other non-specialist settings. They offer practical strategies for effective and realistic classroom intervention, including access to the National Curriculum, and consider the behavioral challenges the child with Asperger Syndrome may pose. Pp. 90. 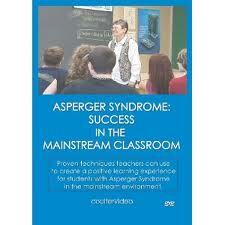 Asperger Syndrome: Success in the Mainstream Classroom featuring Psychologist; professional teaching staff. This DVD shows techniques to help make mainstreaming a child with Asperger Syndrome (AS) a positive learning experience for himself and for his teachers and classmates. 44 minutes. Children and Youth With Asperger Syndrome: Strategies for Success in Inclusive Settings by Brenda Smith Myles. This book contains important strategies in teaching children and youth diagnosed with AS. An essential resource for teachers and other educators presents research-based, instructional, behavioral, and environmental strategies for teachers. Pp. 200.